Reliance Jio, is an LTE mobile network operator in India. It is a wholly owned subsidiary of Reliance Industries is likely to launch its much-awaited 4G VoLTE feature phone within this month, with brokerage HSBC putting the price at as low as Rs 500, a move which could bring in another wave of disruption in the telecom market. The launch of Rs 500 4G VoLTE handset, which some believe could be announced at parent Reliance Industries’ annual general meeting on July 21, would follow Jio’s likely announcement of a new tariff plan with aggressive price-points over the next couple of days with its 84-day Dhan Dhana Dhan offer, announced on April 11, drawing to a close, people familiar with the matter said. Jio is likely to price its 4G feature phone “at a paltry Rs 500 (sub-$8) to lure 2G subscribers to directly switch to 4G”, which implies “Jio subsidising each handset by as much as $10-15 (Rs 650-975)”, Sources said. Analysts expect Jio to dangle a combination of an aggressive tariff offer backed with the mass-market 4G VoLTE feature phone to rev up active subscriber additions. After a speedy start, Jio has seen a slow down in the pace of its customer acquisition, mainly due to the limited number of affordable 4G handsets in the market. But phones supporting 4G VoLTE and priced affordably can help the new operator target millions of 2G featurephone users who have been wary of shifting to smartphones due to the affordability factor and lack of use case. Jio has 112.55 million subscribers as of April 2017. Jio is the only operator which runs a 4G VoLTE network, while its rivals such as Airtel, Vodafone and Idea still are running trials on VoLTE but haven’t launched commercially. “We won’t get into this device price war. Let’s see how deep the hit is,” the executive said, adding the “bloodbath in the market can continue for another year.” He was referring to the ongoing brutal price war since Jio’s entry last September which has hit the incumbent telcos’ revenue and profits and forced raid consolidation in the industry. Jio appears to be ready to flood the market with its 4G devices, having placed orders for 18-20 million of the 4G VoLTE featurephones with some key Chinese original device manufacturers (ODMs) including Zhejiang Techain Electronics Technology Co., Shenzhen CHINO-E Communication Co, Crave and Megaphone. Handset makers sell roughly on average five million feature phones and 15 million smartphones a month. People aware of the details said that shipments should begin from Julyend or early-August, with the company looking at a possible launch for August 15. Jio didn’t reply to separate emails seeking comments on various aspects of the story. 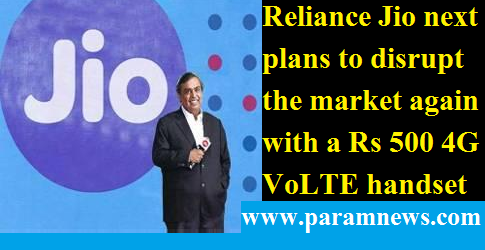 Reliance Jio next plans to disrupt the market again with a Rs 500 4G VoLTE handset Reliance Jio, is an LTE mobile network operator in India. It is a wholly owned subsidiary of Reliance Industries is likely to launch its much-awaited 4G VoLTE feature phone within this month, with brokerage HSBC putting the price at as low as Rs 500, a move which could bring in another wave of disruption in the telecom market.